Maintaining a Healthy Working Dog. INTRO: Maintenance of a healthy working dog does not involve just feeding a quality dry kibble and vaccinating. Working dogs have special physical needs in order to maintain energy, drive and physical fitness. Training and deployments in unusual situations can affect scent, digestion, immunity and mental focus. Small soft tissue strains and strains can lead high-drive animals to compensate and stress other body areas until injuries, some potentially career-ending, occur. Law enforcement dog handlers are already trained observers. The goals of this workshop is to teach canine handlers how to identify problems in their early stages by learning how performance dogs move when both healthy and sore, how nutrients affect energy and immune function and how comprehensive preventive nutrition and integrative medicine can be used to address issues early enough that a valuable canine resource stays working at its peak not only day-to-day but also for a lifetime. THE WHOLE PICTURE (0.5 hour): Understanding why a whole-dog and whole- resource approach is provides for better working life. BASICS OF NUTRITION – BEYOND A BAG OF KIBBLE (1.5 hr): Discussion of special nutritional needs for high drive, deployed working dogs. How certain nutrients benefit specific body and organ functions as well as benefit endurance and mental concentration. Handlers will learn how to evaluate dog foods, blend whole foods, and how to modify diets to meet changes in work load, health and stress. Supplement usage for prevention and correction will also be discussed. STRUCTURE & MOVEMENT (1 hr): Discussion will review the basics of how dogs move. Handlers will learn how to identify normal and abnormal movement as well as tests they can use to evaluate their own dogs. TOOLS FOR FIXING STRUCTURAL ISSUES (2 hr): Discussion will expose handlers to all the many sports medicine techniques, both conventional and integrative that are currently being used to maintain and correct physical problems. Diagnostic techniques discussed will include thermal imaging, ultrasound and digital radiography. Treatment techniques discussed will include chiropractic, massage and acupuncture. HERBS & HOMEOPATHY (1 hour): Discussion will review how herbs and homeopathic remedies work and how they can be used in the working dog to help maintain peak performance and to treat emergency situations. Handlers will learn how to acquire and use natural remedies in their dogs. REHABILITATION (1 hour): Discussion will include defining what canine rehabilitation is and what it does for dogs. Use of rehab and demonstration of rehabilitation stretching exercises in working dogs with ranges of injuries from minor to major post-surgical will give handlers an idea of how they can help prevent minor injuries from escalating and speed up recovery after major injuries. DEMO (THERMAL IMAGING/CHIROPRACTIC/ACUPUNCTURE): if time allows. DEMO (CANINE REHABILITATION TECHNIQUES): if time allows. Alpha K9 Randy Hare's 3 day detection seminar. Click for Registration and Payment information. 11th, 7:00 PM . Please arrive early to watch the K9 teams perform! 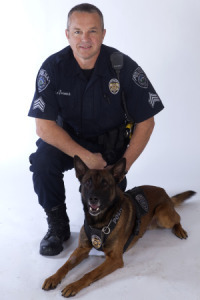 Midvale Police lost a K9 hero in the line of duty during apprehension of an armed and dangerous fugitive. Recently the Unified Police Department began a search for a new dog to work in the detection of human remains, or “cadaver work”. DARE Officer Lopez produces K9 video for the kids. Police Service Dog Ryker passed away on July 8th, 2008.Ryker retired after 6 years of service with the Salt Lake County Sheriff's Office. Friends for S.L. County K9 Donated money to the Mudrock family to offset medical bills for Ryker. Matt Visher from One Shot Photography also donated a beautifully frame photo of Ryker. Friends for S.L. County K9 have purchased a great little tracking hound from White River Kennels.